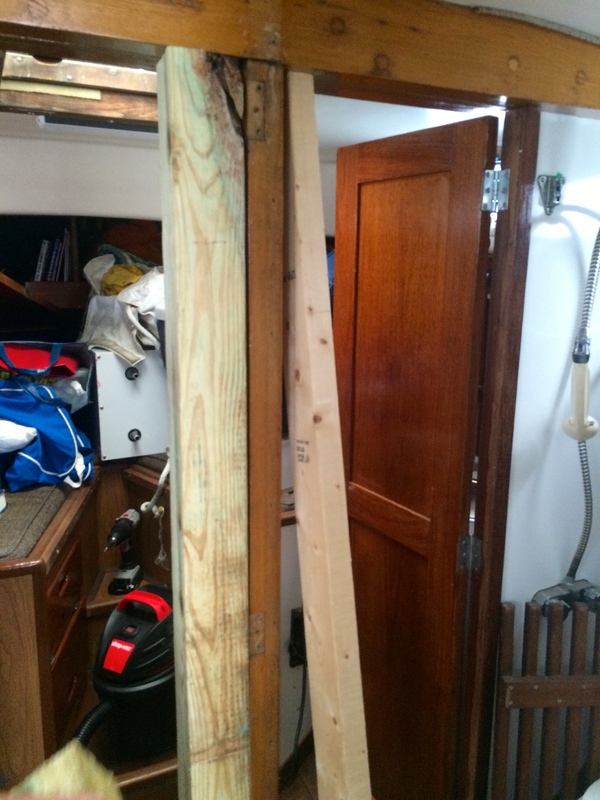 Last week I received a new 2″x 41/2″ White Oak post and a sheet of 3/4″ Marine Ply from Siewers Lumber in Richmond VA, and headed with my friend Edward down to Urbanna in the pouring rain. 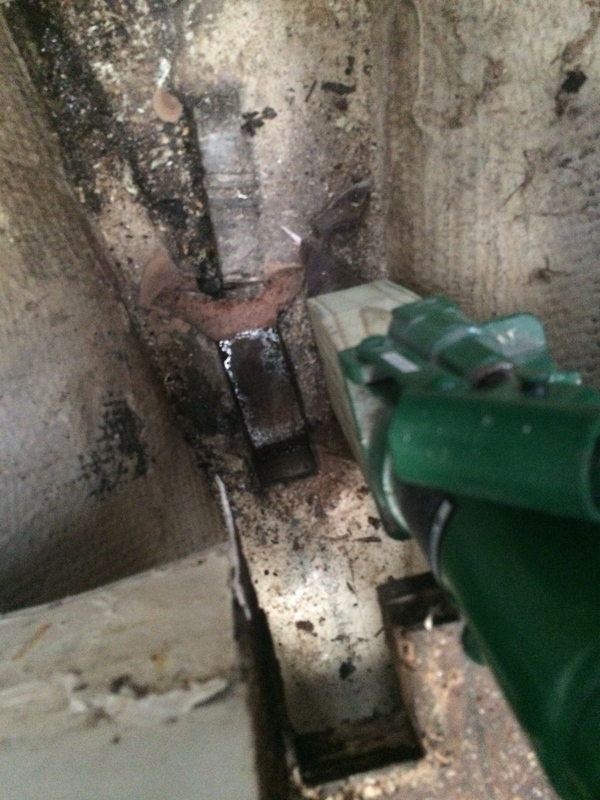 The first job was to remove the cabin sole from around the base of the old post to facilitate removal of the rotten one. 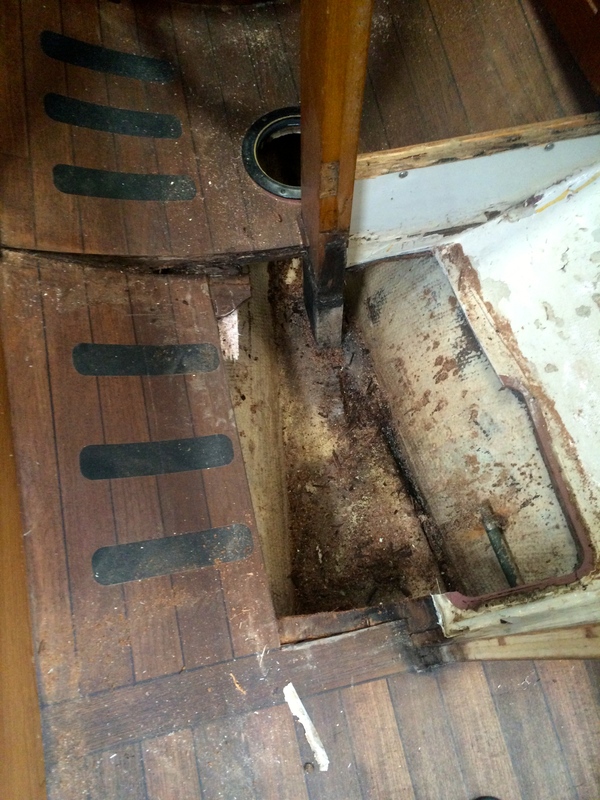 More rot, all the ply had started to delaminate and I realized that the problem had been around for longer than I had owned the boat. 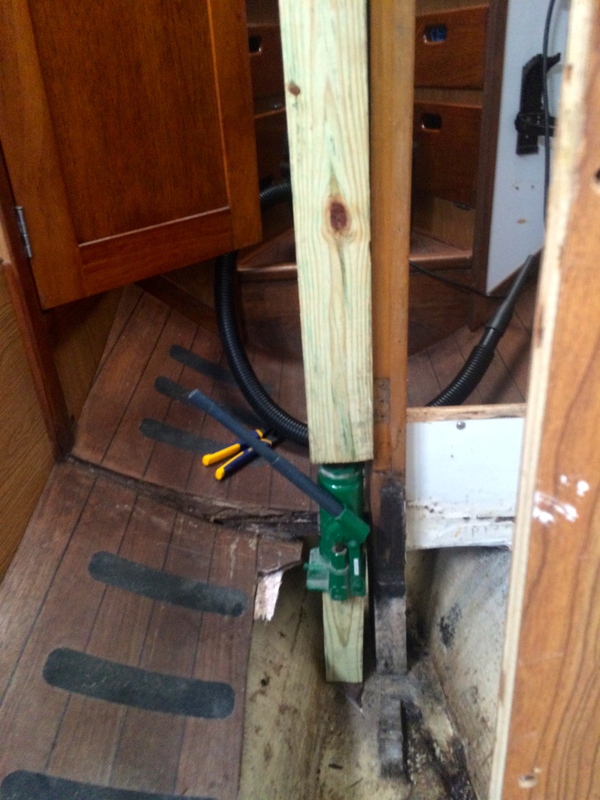 Once we had enough space we had to find a way to get a bottle jack in next to the mast support post. 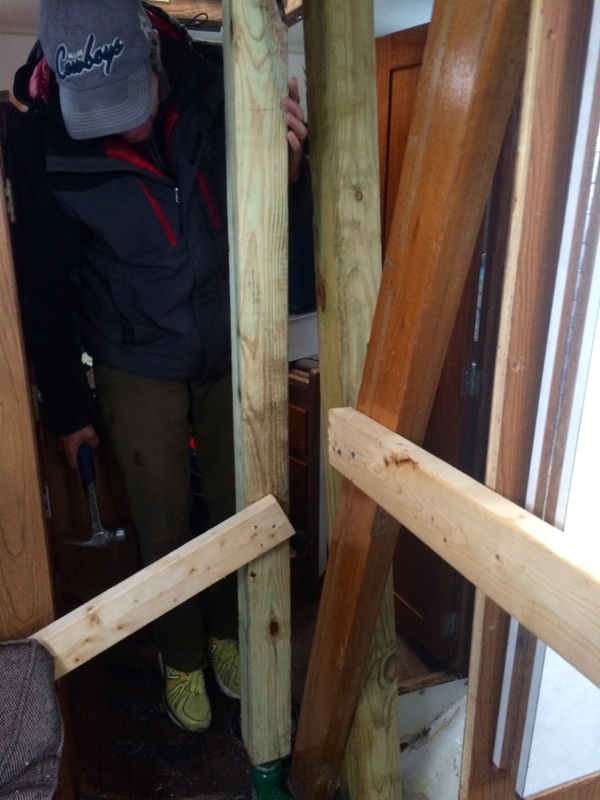 The issue was that the base of the jack was too wide so Edward cut down a length of 4×4 and we slid it in. I made sure that the rigging was slack and we started the somewhat scary process of jacking the mast up to get the clearance we needed to remove the rotten one. 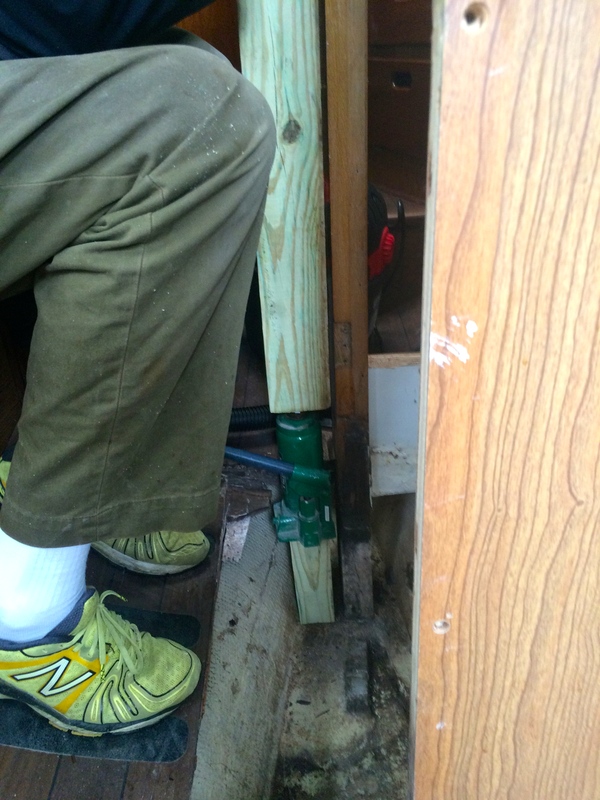 The jack did its work (with plenty of creaking) getting us about a half inch gap between the compression post and the cross beam. The post that had actually looked pretty solid up to this point showed its weakness as the pressure was released and was pretty soft at the base. Now the big issue was that due to the fact we had to base the jack on a block it kept wanting to kick in, really the only thing stopping it doing so was the compression post itself. 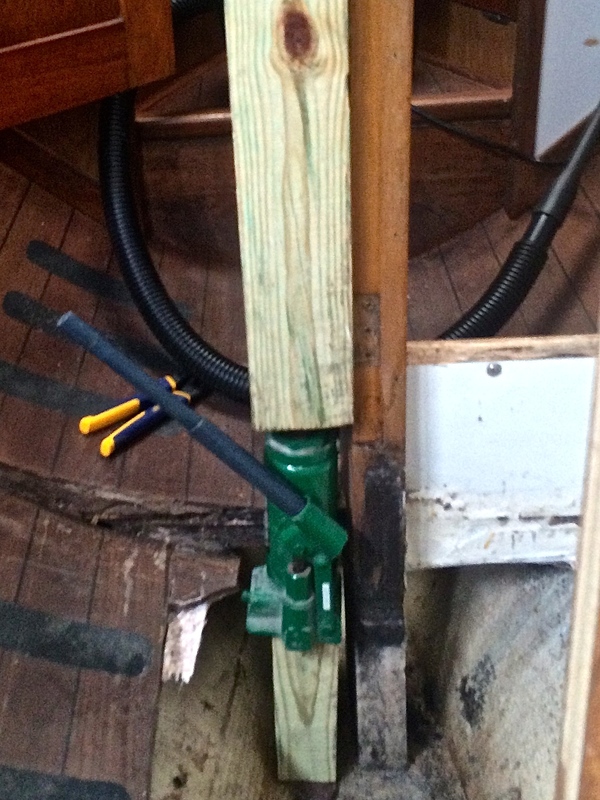 We eased the jack and to our surprise the 2×4 bent just enough to let the crossbeam ease right back down to the post. the problem was that I had no way of bracing the post vertically. The picture of the next step is missing due to the fact that I was fairly anxious at this point and my focus was on the task at hand, but we tried a 4×4 in the same place, and had the same result. There was just enough compression or movement in the 4×4 brace to let the beam drop the half inch back onto the compression post. Then we came up with the idea of screwing a 2×4 to the old post and lifting it out. 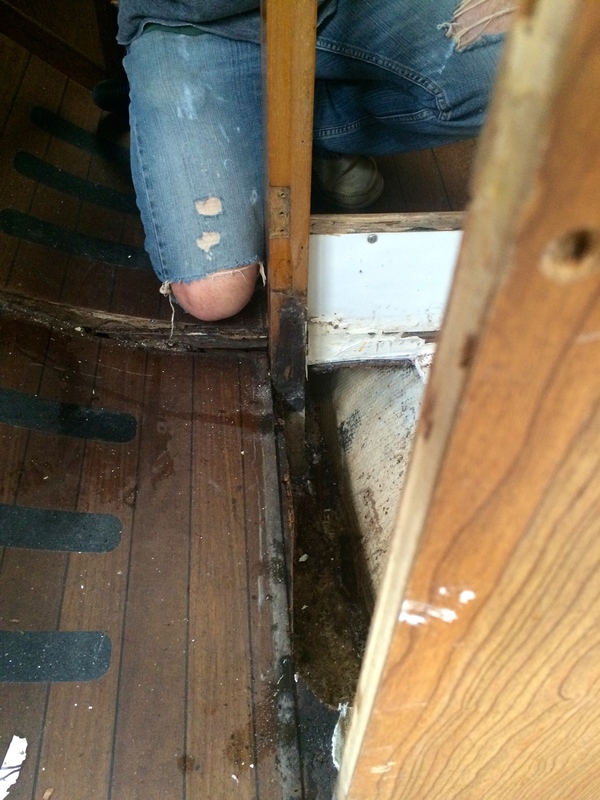 The reason it didn’t just slide out was that there was an unseen inset in the keel, that was full of water. 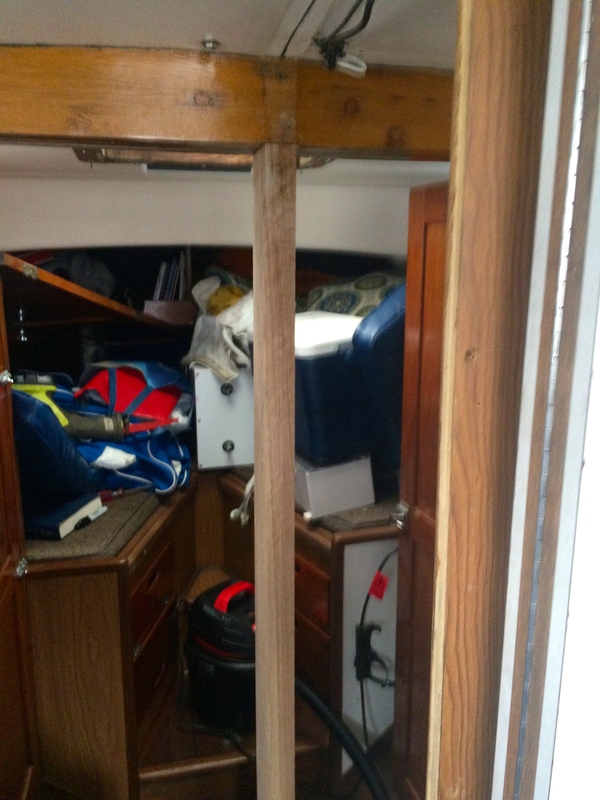 If for any reason that you are doing this on your own boat I would highly recommend that you buy a piece of wood at least a couple of inches longer than you think. The piece that I bought was barely long enough. Before we slid the new post in we coated each end with epoxy to protect against moisture in the end grain, and then with a little help from a hammer she slid right home. 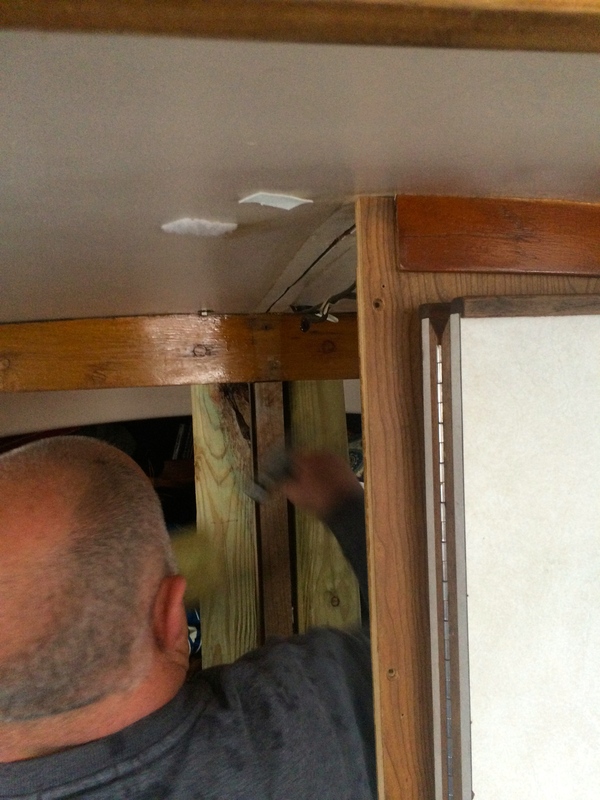 The next job is to rebuild the cabinetry in the cabin but now at least the structure is sound. Thanks Dad. FYI to my knowledge I am the only Seawind owner to do that with the mast up…. Yikes! Scary job. Looks like you’ve got it all sorted though!